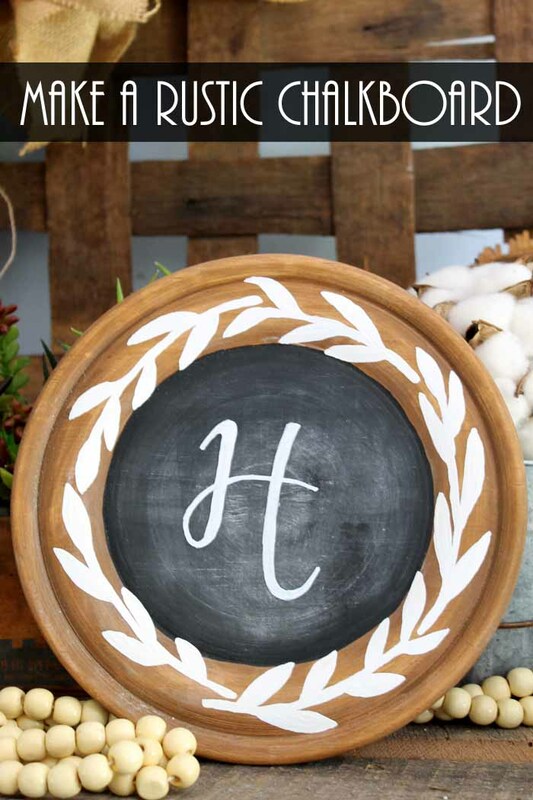 You can make a rustic chalkboard for your farmhouse decor in just minutes with our tutorial below. I really love how this project turned out and I think you will as well. Get your supplies and start on your own version of this project today. This post is sponsored by DecoArt however all projects and opinions are my own. Some links below may be affiliate links which means you do not pay anymore but a portion of your purchase will go to support this site. This is a really easy project. Don’t worry about that decorative painted wreath around the outer edge. I have a method for getting that just right. 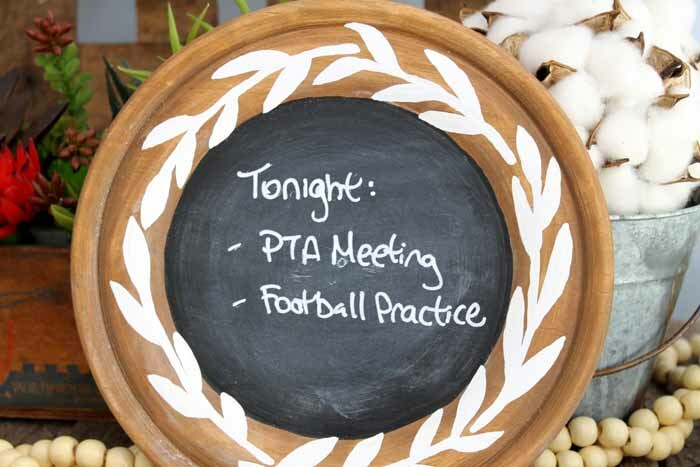 Trust me y’all….anyone can make this rustic chalkboard. Watch the video below to see just how to make it. Can’t watch the video or missed some of the steps? Just read below to get the instructions. Start by staining the outer edge of the plate with Americana Decor Color Stain in Chocolate. Brush on an even coat, allow to sit a minute or so, then wipe off with a rag. I stained the outer edge of the plate as well as a portion of the back that will show when it is hanging on the wall. Next you will need to add chalkboard paint to the center surface. Paint on one coat with a paint brush and then allow to dry completely. Your project will also need a second coat. TIP: When working with chalkboard paint apply the two coats in two different directions to ensure that the entire surface is well covered. Allow to dry according to the package directions. Once dry, you can add the white wreath around the outer edge. Print the wreath file on a standard sheet of paper (download here). If you have a larger plate, enlarge the wreath and print in poster mode. Cut the paper and then tape together to the size desired. Cut out the wreath from the paper. Lay the transfer paper onto the plate next with the shiny side down. Then lay the wreath on top of the transfer paper in the desired location. Tape down to ensure nothing moves. Then use a pen to trace around all of the lines. 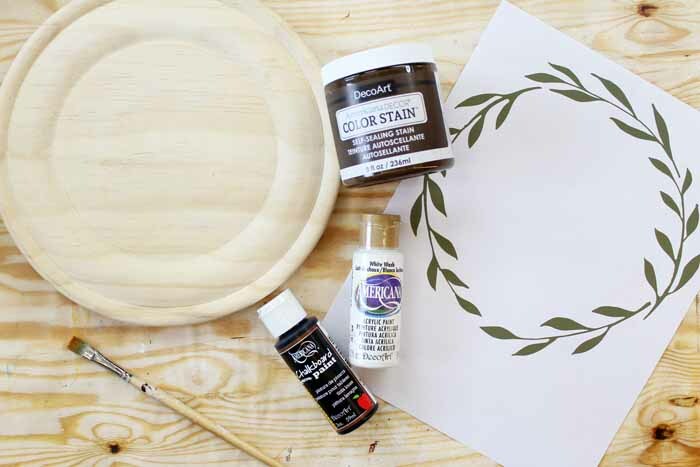 Remove the paper and you will be left with a white outline where you need to paint your wreath. Then use a thin paint brush and white paint to fill in the wreath with a couple of coats of paint. Allow everything to dry completely. To prepare chalkboard surface, rub the edge of a piece of chalk over the entire surface then erase. You will also need to add something to the back if you are hanging on a wall. Try a saw tooth hanger or a piece of twine hot glued in a loop. 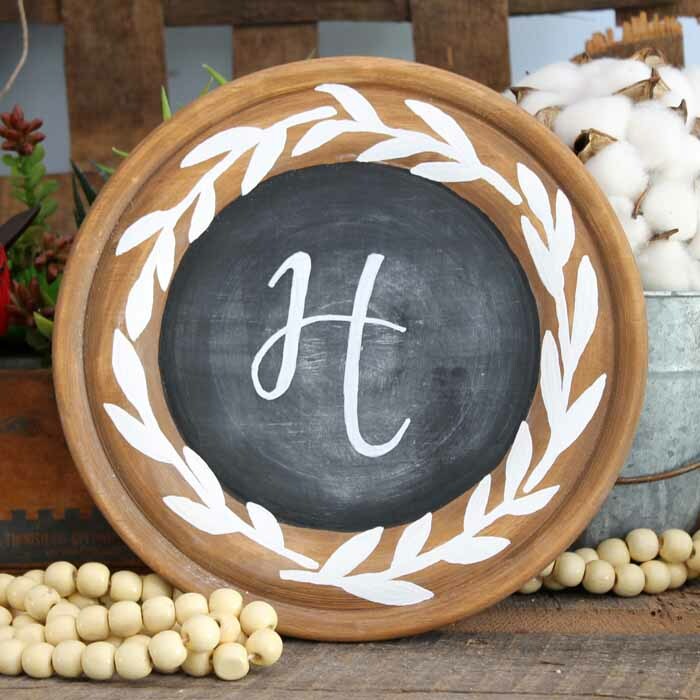 Your rustic chalkboard is ready for use around your home. TIP: To get clean chalk lines on any chalkboard surface use a chalk marker. These make clean lines and can only be erased with water. Draw anything you would like on the surface of your chalkboard. Here we added a monogram but you can add anything your heart desires. 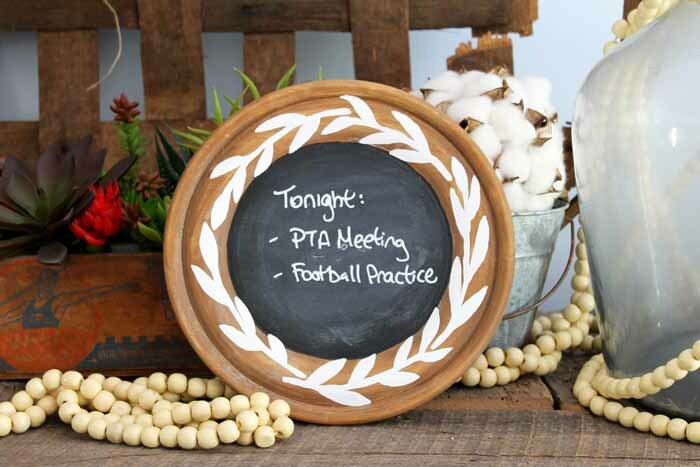 This rustic chalkboard can also be used for family reminders. In fact, it is perfect for back to school. Who says a command center chalkboard has to be ugly? Make a gorgeous chalkboard then proudly display it around your home. 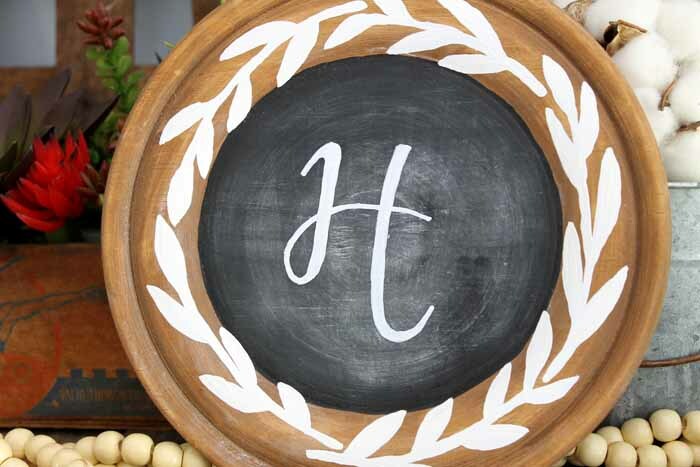 So tell us, will you be making a rustic chalkboard for your home? I am off to enjoy my version! I am in love with this farmhouse style project. next post: Handmade Jewelry Box: Make this Yourself! That is super cute. Pinning! This is beautiful! I can’t believe how easy it to make, either. Thanks for the awesome tutorial! I love chalkboards and yours is absolutely perfect! This is so pretty. I love the way it came out! I really like the leaves around the outside, too! This is a cute little chalkboard for a quick little saying or a note. It is adorable. Super cute, and very creative! I love how cute this is! The perfect size to use for write down reminders!! Thanks for sharing at Celebrate It!